Compact Fluorescent Lamps or CFL’s are increasingly grabbing the attention of wide range of people ranging from scientists to environment agencies and everyone in between. It can be expected that this lamp in the form of a “ice cream cone swirl” can be the successor of lighting apparatus all over the world with its advantages of power saving, eco-friendly technology and limited disadvantages. 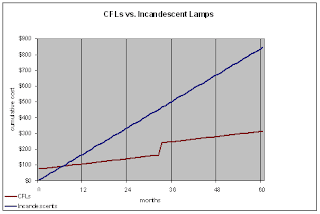 Here we discuss the advent, advantages and applications of CFL’s in daily household purposes of lighting. The use of CFL’s can be regarded as one of the simplest solutions to the major problems faced by environmentalists and governments world wide. This is because of the fact that its use can cut energy consumption and emission of green house gases which further reduces dependence on coal and oil for production of power and also reduces dangerous effects like global warming. Also from a simple point of view they provide soft, bright and clear lighting which is dependable, very efficient and durable. The first CFL was made by Peter Cooper Hewitt who designed a simple mercury discharge lamp for the purpose of photography. General Electric pioneered the design of the CFL as two of its engineers George Inman in 1938 and Ed Hammer in 1973 upgraded its design to create the modern CFL. For two decades, CFLs lacked precisely what we expect from light bulbs: strong, unwavering light; quiet; not to mention shapes that actually fit in the places we use bulbs. Since 1985, CFLs have changed as much as cell phones and portable music players. 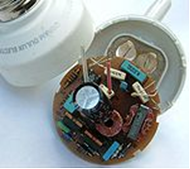 There are two main parts in a CFL: the gas-filled tube (also called bulb or burner) and the magnetic or electronic ballast. An electrical current from the ballast flows through the gas, causing it to emit ultraviolet light. The ultraviolet light then excites a phosphor coating on the inside of the tube. This coating emits visible light. The most important technical advance has been the gradual replacement of electromagnetic ballasts with electronic ballasts; this has removed most of the flickering and slow starting traditionally associated with fluorescent lighting. 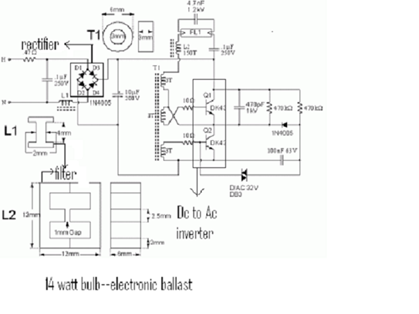 Electronic ballasts contain a small circuit board with rectifiers, a filter capacitor and usually two switching transistors connected as a high-frequency resonant series DC to AC inverter. The resulting high frequency, around 40 kHz or higher, is applied to the lamp tube. 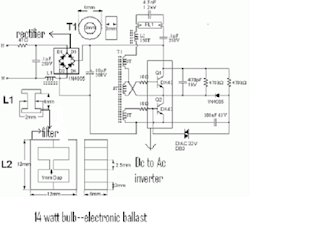 Since the resonant converter tends to stabilize lamp current (and light produced) over a range of input voltages, standard CFLs do not respond well in dimming applications and special lamps are required for dimming service. CFLs that flicker when they start have magnetic ballasts; CFLs with electronic ballasts are now much more common. Integrated CFL’s: They consist of electronic ballast and an Edison screw or bayonet fitting in a single unit. This is a rather inexpensive way since it uses already existing infrastructure and easy to install. CFLs are produced for both alternating current (AC) and direct current (DC) input. DC CFLs are popular for use in recreational vehicles and off-the-grid housing. Some families in developing countries are using DC CFLs (with car batteries and small solar panels) and/or wind generators, to replace kerosene lanterns. CFLs can also be operated with solar powered street lights, using solar panels located on the top or sides of a pole and luminaries that are specially wired to use the lamps. 2) By using integrated type of CFL’s the average energy bill would be reduced to such an extent that the cost for purchasing them can be covered in a period of 6 months use. 3) They last longer than normal incandescent bulbs averaging about 6000-15000 hours and if used for nearly 8 hours everyday can last about 2-5 years on an average. With further care and efficient usage they can last up to 10 years. 4) The lighting produced is flicker free and is constant for a very long time. Also it starts instantaneously and can be used with dimmer circuits for controlling the intensity of light and 3 way switches. The come in a variety of shapes and rating to suit various lighting needs ranging from normal household lighting to industrial lighting. They can be fixed in different positions also. 5) A normal 150 W incandescent bulb can be effectively replaced by a 32 W CFL. This can cut the energy consumed by nearly 950 W. using this bulb we can cut carbon emissions due to power plants by 300 kg. Also during its lifetime of say 10000 hours it can cut emissions by 1800 kg. This is done by a single CFL! If every household were to put one in their homes then we can save enough coal to last 6 years. 6) According to the Union of Concerned Scientists, if every U.S. household replaced just one regular incandescent light bulb with a compact fluorescent light bulb, it would prevent 90 billion pounds of greenhouse gas emissions from power plants, the equivalent of taking 7.5 million cars off the road. And the U.S. Environmental Protection Agency says that by replacing regular light bulbs with compact fluorescent light bulbs at the same minimal rate, Americans would save enough energy to light more than 2.5 million homes for a year. 1) The bulbs contain mercury—about 5 milligrams. This is used for making the CFL an efficient light source. This causes the problem of safety if the bulb breaks. 2) The bulbs can cause interference with other appliances like televisions, radios etc because they emit infrared radiation which can be mistaken as an input signal by such devices. 3) They cannot be disposed easily and must be carefully recycled due to the presence of mercury. 4) They cannot frequently be turned on or off since that reduces the life span. The minimum turn on duration for satisfactory operation is 15 minutes. 5) They cannot be used with timer switches and photovoltaic cells since these can reduce the life span of the CFL. 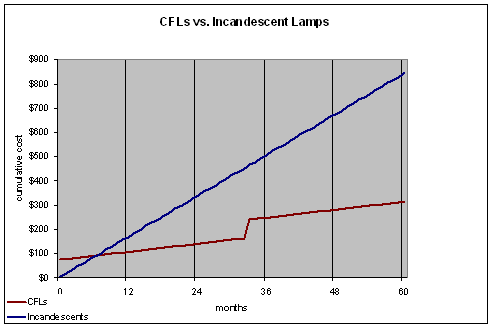 Even though the CFL’s contain mercury a coal-fired power plant will emit 13.6 milligrams of mercury to produce electricity required to use an incandescent light bulb, compared to 3.3 milligrams for a CFL. Also the risk of air borne mercury poisoning is very low and does not pose a serious threat. Also the risk is much lower than mercury present in consuming fish. Also many of the commercial CFL’s are Energy Star certified meaning that they are highly energy efficient. 2) Consulting purchase manuals and brochures of manufacturers like GE, Philips etc can give a better idea since they give a wide range of products for different needs. 1) If the CFL ever breaks then the glass shards should be swept and removed carefully. The glass shards should not be touched with bare hands. 2) The CFL’s should be disposed of carefully in plastic bags or recycled. 3) They should not be used in places subject to vibration like fans since they work inefficiently in such places. If there is a single way everyone can contribute to the problems faced by the environment and the energy scenario of the present this can be considered the most simplest. Also this is a long term solution for lighting problems which is cheap and energy efficient. LED light bulbs technology is making inroads in every market, with an LED bulb for any application. LEDs have a long list of advantages over incandescent and CFL lighting. A common complaint about compact fluorescents is the ramp-up time to full brightness. Instant-on CFLs provide light instantly, but still require time to reach full brightness. LED light bulbs provide full illumination from the moment they’re turned on. A lot of people taking Electrical Training Courses will definitely agree with me. This is actually a good research paper about flourocent lightning. Something that students can use as a help with a research paper writing about light and its effects. You may be qualified for a new government solar program.